Today was the start of the tour- with the opening session for a great audience in Hobart Tasmania. Hosts Jen and Elisabeth were excited that they had an audience of more than 60 sign up and show up, some of them driving 4 or more hours from the northern regions (One group even used that as their story project, see links below). I have an amazing story of web serendipity to come in the post after this. Stay tuned. After that, we moved into the 50 Web 2.0 Ways to Tell a Story hands on session, and this crowd truly dived into this, exploring different web tools, and coming up with some demonstratable outputs for even this short 45 minute immersion. We used slideroll to make a simple story about “searching” (for a library presentation). Really really easy to use. Cathrine and Lynne did a story about travel. Here are some photos from my holiday. Enjoy! John’s extensions Start to finish images showing the extension project. sharon & garrys synpse one instruction, two minds, 49 programs and we still lost the text. I wa asked to do an impromptu short overview of tagging in del.icio.us, so I used a mixture of some prepped and unprepped material to demo some of the ways I use del.icio.us for both personal and group resource organizing / republishing. But now I am back in Melbourne, a lovely city view room this time from the Rendezvous Hotel, and scrambling to prep my materials and my body for the next session tomorrow morning. Sounds like you are both having a fun time and are a hit. Re tech stuff. I ended up making myself a checklist so I would not leave stuff behind because after about a week my brain would not do a good job of remembering. 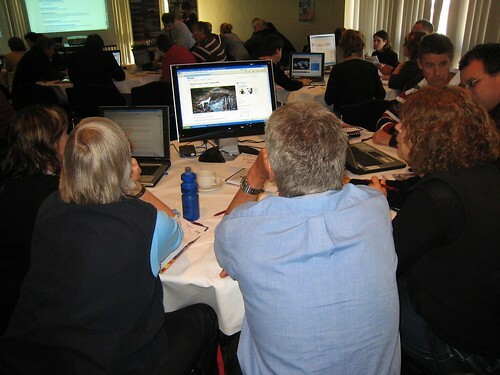 Pingback: Mobile Technology in TAFE » Blog Archive » Exploring Ports, Libraries and Chocolate! What a Day!